It may seem like once the foundation is built, you don’t need to worry about it anymore. However, the reality is just the opposite. Over time, the foundation settles, and if it was installed incorrectly, it may not hold up the way it should. Additionally, water in the soil around the foundation can cause big problems with hydrostatic pressure for even the best built foundations. It is the force of the water in the soil against your foundation. This can be caused when there is not proper drainage in the yard, but it can also be caused by cold temperatures which freeze and thaw the water causing it to push against the foundation. Pressure of this magnitude can cause the walls to bow and lean. Unfortunately, hydrostatic pressure will always be something that the foundation must battle against, but there are ways to help your home out. ECP has a choice of three different products for wall repair. Each has its positives and negatives for your goals, budget, and time. We can use helical tiebacks, plate anchors, or carbon fiber to give you a stable and safe foundation. Additionally, the use of sump pumps, exterior waterproofing, and other systems to make sure that your yard and basement are still draining in the case of extra water may be recommended for your specific situation. This type of foundation support is popular commercially because of its strong hold and the ease of measuring the load capacity. It is also easily installed, and it can be installed in any weather. This makes it helpful to commercial entities that need things done quickly and with little mess, but also need to follow code and make sure that their business is always safe. ECP uses plate anchors the most because they are the most economical and there is little landscape disturbance. This makes them great for residential homes. Additionally, they apply lateral force to stabilize the foundation wall, which makes them a great choice for strength and durability. Rhino Carbon Fiber is the strongest system on the market because of its patented system that connects the foundation base to the house framing. This provides a much stronger base than other foundations that do not account for walls that go past the support. It can also repair other forms of damage, like destabilizing cracks and splits, which makes it a great choice for jobs with a variety of issues that need solved. It can be installed in all weather, and it doesn’t have to be an eyesore when it’s finished. Rhino Carbon Fiber can easily be painted over and become almost invisible. 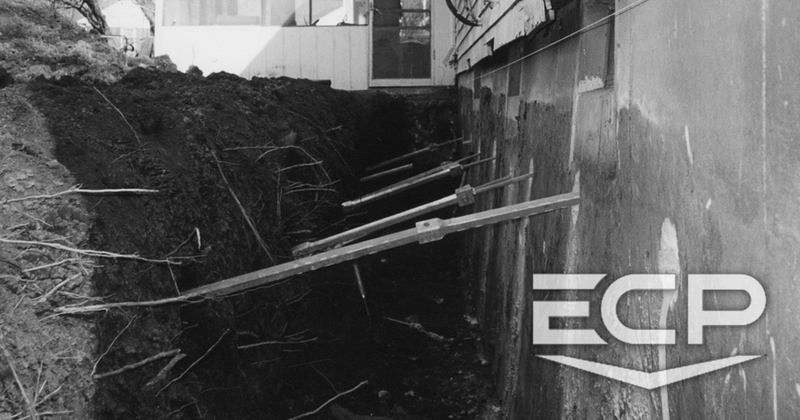 Whatever your foundation problem, ECP has the solution. Contact us today and get started on fixing up your foundation!